Fall is in full swing and we've finally pulled all the sweaters and boots to the fronts of our closets. Wearing the same shades of cream, olive, and navy can get a bit boring. 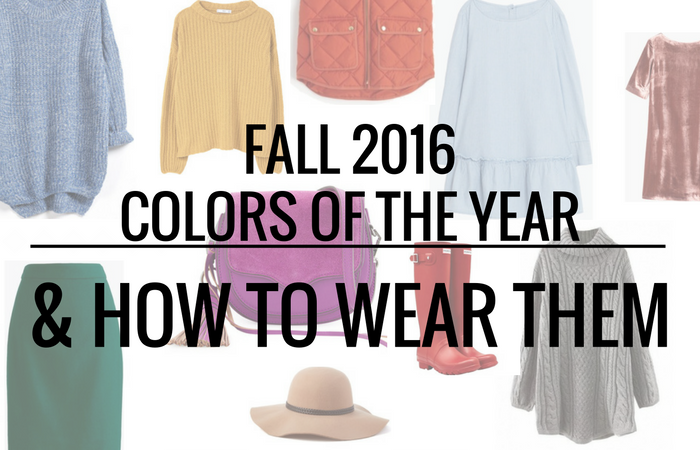 Luckily, the Pantone Color Institute graced us with their top color picks for Fall 2016 fashion. "The desire for tranquility, strength, and optimism have inspired a Fall 2016 color palette that is led by the Blue family. Along with anchoring earth tones, exuberant pops of vibrant colors also appear throughout the collections. Transcending gender, these unexpectedly vivacious colors in our Fall 2016 palette act as playful but structured departures from your more typical fall shades. Blue skies represent constancy as they are always above us. Grays give a feeling of stability, Red tones invite confidence and warmth, while the hot Pinkish Purples and Spicy Mustard Yellows suggest a touch of the exotic." I don't know about you, but that quote from Leatrice Eiseman, Executive Director of the Pantone Color Institute, inspired me to try to incorporate more color into my fall wardrobe. Today on the blog I'm sharing all 10 fall colors of the year and how you can incorporate them into your existing wardrobe! Airy Blue is a fresh take on one of the 2016 Colors of the Year: Serenity. You may already have this color in your closet from earlier in the year. Make it fall appropriate by paring it with shades of cognac, hunter green, and taupe. This warm red is perfect for adding a fun pop of color to those monotonous fall outfits. A bold red lip would also be a great way to rock this color all fall long. This eclectic purple shade is definitely unexpected for fall, but it pairs well with so many colors we wear around this time. A colorful bag that can be pulled out once summer hits would be the best way to explore this color choice. Velvet is making a huge comeback this fall. It's the perfect material to showcase Dusty Cedar: a nod to the other 2016 Color of the Year, Rose Quartz. This muted pink color is fall's answer to the baby pinks we've seen all spring and summer. This lush green color is vibrant, yet sophisticated at the same time. It resembles Emerald Green so you may already have it in your wardrobe! Give it a refresh by pairing it with Potter's Clay or Airy Blue. This earthy mix between cognac and orange is what you usually expect to see this time of year. However, Potter's Clay is a fresh take on the brown and orange hues we see in the autumn. Pair it with Lush Meadow and Spicy Mustard for the perfect fall-colored outfit! This vibrant, yet sophisticated blue is a familiar friend in a sea of random faces. Most denim is similar in color to this cool, calming shade so it easily pairs with any color on this list. This dark gray color is the perfect neutral to pair with any color in your closet. 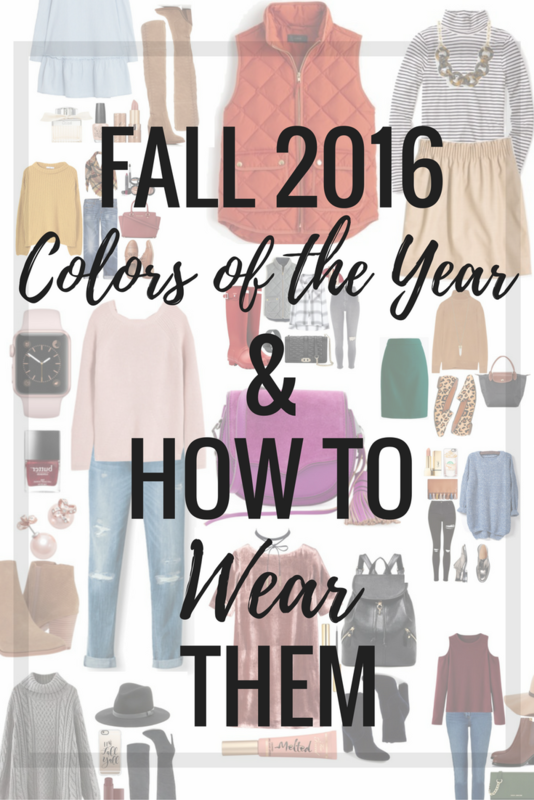 Pair it with any of the colors on this list for a contemporary fall look. If you're looking to add a splash of color to your wardrobe this fall, Spicy Mustard is a great addition. A variation of this color always seems to make an appearance around this time of year so it should come as no surprise this year. Another neutral that can be easily paired with any color on this list! From booties to floppy hats, sweaters to wool skirts - this color has been a fall staple forever. Invest in a great pair of booties or a handbag if you're looking to incorporate this color into your wardrobe and keep it there. I'm actually pretty excited to see if I can include more of these colors into my closet without breaking the bank! Which one of these colors is your favorite? I'm a huge fan of Sharkskin, but Airy Blue is definitely a close second!